Most Bible readers missed the real interpretation about the coin mentioned in the three synoptic gospels (Matthew, Mark and Luke), which out laid the Messiah’s reply to the elders of the Synagogue (Church or Temple). So magnificent was the reply (prophecy or parable) of the Messiah, that it surrenders the attempt of the Scribes, Pharisees and Sadducees, who wittingly seek to set a trap (words of deceit) that would use to accuse the Messiah. The Pharisees, eager to put away the “Son of Yahweh (God),” took counsel on how they would entangle Him by way of His speech (Matthew 22:15). Earlier, as the Book of Mark (chapter 12:12) indicates, we would understand that the Pharisees had “sought to lay hold on Him (Messiah), but feared the people”. On taking counsel, they decided to send their messengers (the Pharisees and followers of the Herodians) to put the Messiah on the spot. In doing so, they would decide how to figure His loyalty to Caesar. The answer expected (given), would encourage the people to set hand against the Messiah, if He had manifested an act against the divinity and laws of Caesar. “Master …thou art true, and teachest the way of God in truth” (Matthew 22:16}. “…neither carest thou for any man: for thou regardest not the person of men” (Matthew 22:16). “What thinkest thou? Is it lawful to give tribute unto Caesar, or not”? (Matthew 22:17). The question was on the tribute (collecting taxes) to Caesar, but the intention was about the loyalty to Caesar and the throne (seat) of Rome. However, Caesar identifies himself as a god, and on that note, you would solemnly swear to honour Caesar as a divine, and pay all taxes due to him (Caesar). Paying tributes or taxes shows submission to Caesar, as both you and all that you earned are property of Caesar and Rome. Therefore, the question that came from these elders was as according to such terms demanded by Caesar and Rome. However, the answer given by the Messiah did not portray a forward answer, such as to defame Caesar and his glory. Instead, the answer brought confusion to the mind of the Pharisees and the Herodians. Christ, using diplomacy in His answer, asked for a “coin” (“penny”). By asking for this denarius (coin), Christ’s intent was to show the “hypocrites” (Pharisees and Herodians) the supposed glory that they honoured (worshipped), and that “no servant can serve two masters…Ye cannot serve God and mammon” (St. Luke 16:13). “Whose is the image and superscription”? (Matthew 22:20). Christ, as for using the words “image” and “superscription”, indicated that the culture and laws of Rome were about servitude only to such images. In addition, this servitude has nothing to do with the Supreme that the Jews honoured by paying their dues (sacrifice, offerings and praise). “It was Caesar’s” (Matthew 22: 21 KJV). “Render therefore unto Caesar the things which are Caesar’s; and unto God the things that are God’s (Matthew 22:21 KJV). Most people have the idea that the answer’ given, only linked to the “COIN” as the SUBJECT. However, the answer was universal and prophetic. 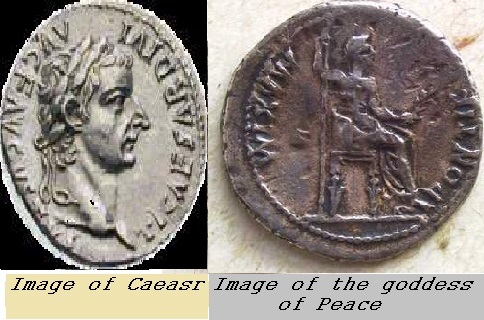 The coin, having such image(s), serves as a token to the power of Rome (seat of Satan and his throne). One should understand that all Caesar’s images were as a god, and all seemed superior (supreme) in their portfolio. In this regard, the Messiah uses this coin as a symbol to go with His reply. Let’s take in consideration the Book of Matthews 6:2, 5 and 16, which speaks of the differences of one’s behaviour from that of the Scribes and Pharisees. The Scripture made reference thrice of the word “hypocrites”, where Christ’s words explained disapproval of one being like these Scribes and Pharisees. “If thine eye is evil, thy whole body shall be full of darkness” (Matthew 6:23). In this instance, the “eye” is as the Pharisees, the prime factor of the body that represents the Church (the synagogue). It’s evident then, in that the elders of the synagogue, should with intent having an eye of light, now have an eye of evil that poisoned the body (Church) to perceive darkness. On this note, Christ’s words ratifies that statement conclusively in verse 24 saying, “Ye cannot serve God and Mammon,” which is to say, one can’t serve God and Rome (seat of Caesar) together. Pingback: THE HIGH PRIEST – PHARISEES – RENDER THEREFORE UNTO CAESAR (MATTHEW 22:22) | My Blog Title is "THE UNVEIL PERSPECTIVE"